HOUSTON — The Battleship Texas, which has been stabilized since the historic vessel sprang a significant leak over a week ago, will be closed to the public starting today until repairs can be completed. “The closure will be for the duration of the salvage company and dive team repairs, a process we hope will take no more than a week,” said Andy Smith, Battleship Texas State Historical Site superintendent. Currently, the ship is stable with a 1- to 2-degree list to the port and an estimated water inflow rate of less than 100 gallons per minutes. Earlier this week, the rate was 850 gpm, Smith said. Clean-up of onboard oil residue continues and is in its third phase. Meanwhile, pumping will continue to keep up with incoming flow with all preparations in place to increase capacity as needed up to about 2,500 gpm with a combination of 4-inch electric and 3-inch pneumatic pumps. These will continue on an around-the-clock basis. 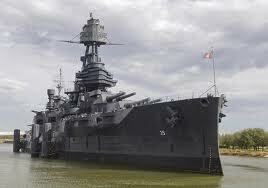 Anyone wishing to make a donation toward the preservation of the 100-year-old battleship may do so atwww.battleshiptexas.org.